PUEBLO, CO (May 22, 2018) – For more than two decades, CSU-Pueblo and the Boys & Girls Clubs of Pueblo County have partnered to provide a variety of educational and recreational opportunities for members and CSU-Pueblo students as well as co-sponsor the Youth of the Year scholarship program for the last eight years. The Boys & Girls Clubs of Pueblo County currently has three sites –the Sangre de Cristo housing complex, Risley International Academy of Innovation, and McHarg Community Center at Avondale and recently the two organizations announced an expansion of their partnership with the opening of a Summer Only Site on the CSU-Pueblo campus. President Mottet said, “CSU-Pueblo is excited about this partnership. We believe it coincides well with the university’s intent to serve our local community and do our part to strengthen the university-going culture, so that one day every home in Pueblo will have a college or university diploma on the wall”. The summer program at the Boys & Girls Clubs of Pueblo County is nine weeks of interactive field trips, engaging physical activities, and academic enrichment that fosters leadership skills and builds self-confidence in a safe, positive environment. Our expert youth development professionals strive to provide activities that challenge members, that give members new experiences, and that allow members to let loose and have fun. Our goal is to keep summer camp engaging for your kids and affordable for you. “Boys & Girls Clubs of Pueblo County is proud of our unique partnership with the University. This opportunity for our community youth is only one of five clubs on college campuses in the country” says Angela Giron, Boys & Girls Clubs President/CEO. A press conference was held at 10:00 a.m. on Tuesday, May 22, 2018 in the Occhiato Student Center at CSU-Pueblo. 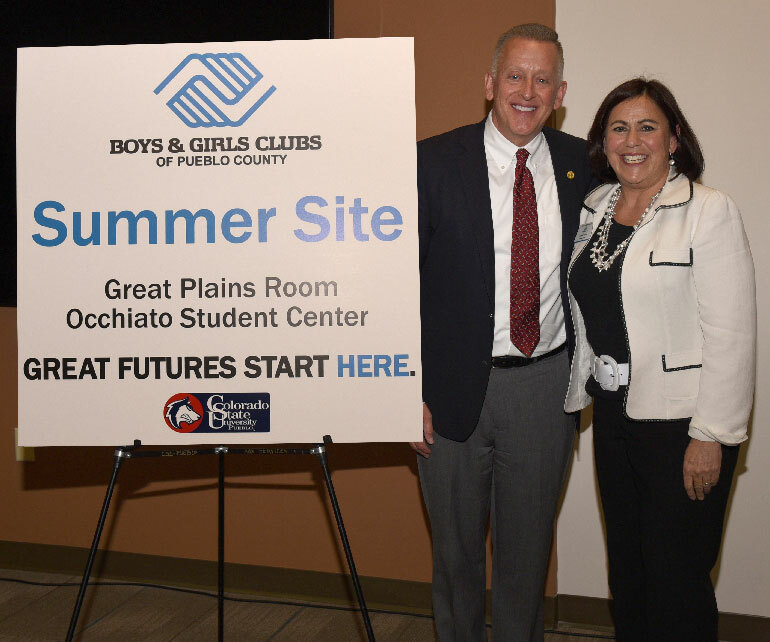 The agenda included Colorado State University-Pueblo President Timothy Mottet and Boys & Girls Clubs of Pueblo County President/CEO Angela Giron, Boys & Girls Clubs of Pueblo County Board Chair Jennifer Mullen. Additional speakers included Boys & Girls Clubs of Pueblo County Youth of the Year Recipients. For more than 46 years, Boys & Girls Clubs of Pueblo County (BGCPCkids.org) has enabled young people, between the ages of 6-18, who are most in need to achieve great futures as productive, caring responsible citizens. Today, our three Clubhouses serve nearly 1,000 young people annually through Club membership and community outreach. They provided a safe place, caring adult mentors, fun, friendship, and high-impact youth development programs emphasize academic success, good character and citizenship, and healthy lifestyles. The Club offers specialized teen programming until 11 PM on Fridays. Learn more about the Club on Facebook and Twitter.